As a kid, I remember the exact moment my perspective with comics changed. My parents would take child me and let me go over to the $1 comic table at the mall and pick up any comic of my choice. I don’t think my parents knew that some of these comics were clearly not for kids. But they let me get them anyway. I do remember getting some The Simpson’s comics which were more for kids, but I mostly picked up any and all X-Men. As a little girl, and even today, I was totally drawn to Logan. I mostly just looked at the pictures and imagined my own story going on, but I remember the moment that all changed. It was the X-Men issue where you find out that Nightcrawler is Mystique’s son… I remember just being blown away, that wow, these comics all connect in an overarching story! And that was the day I became a woman… jk, I’m still working on that. But it sure did feel like a maturing moment in my childhood. With the LEGO 2 movie coming out this week, I wanted to dedicate this article to all the kids out there that might need some comic book recommendations so they don’t end up like me, haha. It’s very clear how important imagination and storytelling is at a young age. Especially with so many kids being fed hours and hours of electronics, let’s not forget about those good old fashioned paper books! So here we go, and in no particular order, my very bias favorite comic books for kids. NOTE TO PARENTS: I do honestly believe that these comics that I have recommended are appropriate for the age ranges stated. But I do understand that it is possible that these comics can also not be appropriate for every child in the age range. As a parent, you should look into and read the comic first before blaming me for possibly corrupting your child. Winner of 11 Harvey Awards and 10 Eisner Awards including Best Cartoonist and Best Humor Publication, as well as being named Best Comic Book by the National Cartoonists Society. After being run out of Boneville, the three Bone cousins, Fone Bone, Phoney Bone and Smiley Bone are separated and lost in a vast uncharted desert. One by one they find their way into a deep forested valley where they encounter the wonderful people and creatures that live there. As time goes on, they soon discover that the people there are threatened by a dark entity, the Lord of the Locusts. The Bones are quickly drawn into the events around them, and are compelled into a quest to help free the Valley! It will be the longest – but funniest – year of their lives. Nominated in the “Best Limited Series” category of the 2008 Eisner Awards. 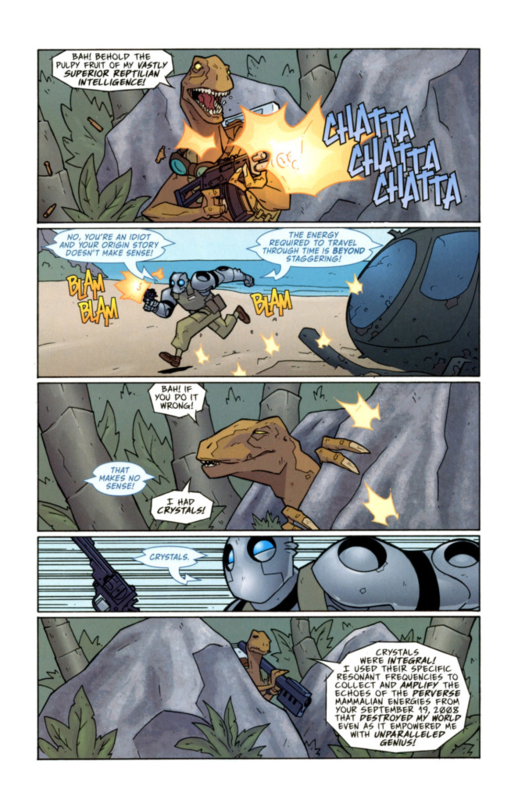 The series is split into several mini-series, each depicting a different era and adventure in Atomic Robo’s long life-span. It follows the adventures and misadventures of Atomic Robo, a sentient robot created by Nikola Tesla. Having studied in most fields of science under Tesla, Robo has fortified his mind with knowledge, in addition to his already armored (and bullet-proof) skin. In the past, Robo has fought an entity from beyond time, formed a group of Action Scientists, and defeated a Nazi scientist, among many other adventures. Ronnie is just a normal fifth-grader trying to pass her science class’s impossible quiz on the history of dinosaurs . . . until she happens upon her neighbor—Ms. Lernin—a retired paleontologist. With the assistance of Science Magic, Ronnie and Ms. Lernin travel back through time and space to experience the Mesozoic Era firsthand. They visit three important time periods in the development of the Mesozoic Era: the Triassic, the Jurassic, and the Cretaceous. Along the way, Ronnie finds herself face-to-face with real-life dinosaurs and reptiles, like stegosauruses, velociraptors, and thalattosaurs. With the help of her neighbor’s trusty knowledge of prehistoric times, she learns the differences between herbivores, carnivores, and omnivores, as well as between dinosaurs, insects, and reptiles. 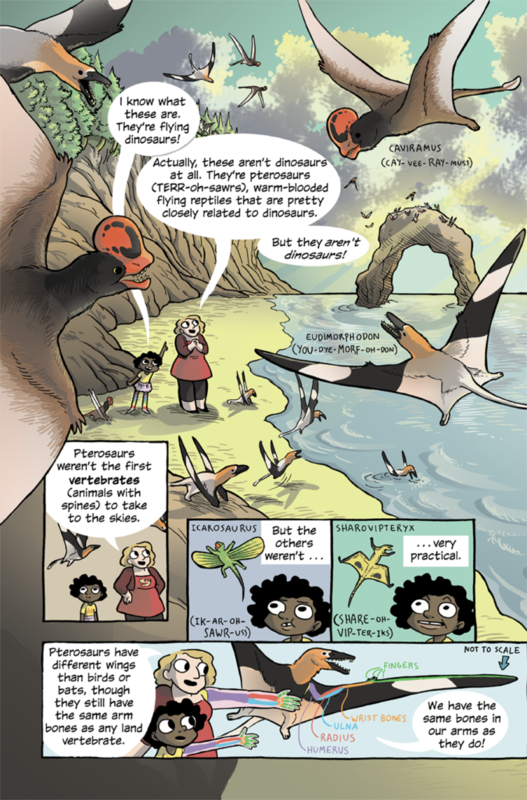 This insightful and informative graphic novel uses engaging art to bring facts to life, giving kids the tools to understand the evolution of these prehistoric creatures and the important effects this era had on our world today. When Ronnie’s parents go on a business trip and leave her with Miss Lernin for the week, Ronnie is sure she’s in for a big, dinosaur-size adventure. After all, her last trip with Miss Lernin involved real-life dinosaurs! So, when they end up at the aquarium’s jellyfish exhibit, Ronnie is confused. Surely jellyfish aren’t as cool as dinosaurs, right? Wrong! Determined to show Ronnie just how interesting prehistoric life was before the age of the dinosaurs, Miss Lernin takes her back in time to the six parts of the Paleozoic era to study the earliest lifeforms on Earth, and how many left the ocean for life on land. Featuring Supergirl, Wonder Woman, Bumblebee, Batgirl, Harley Quinn, Katana, and Poison Ivy. 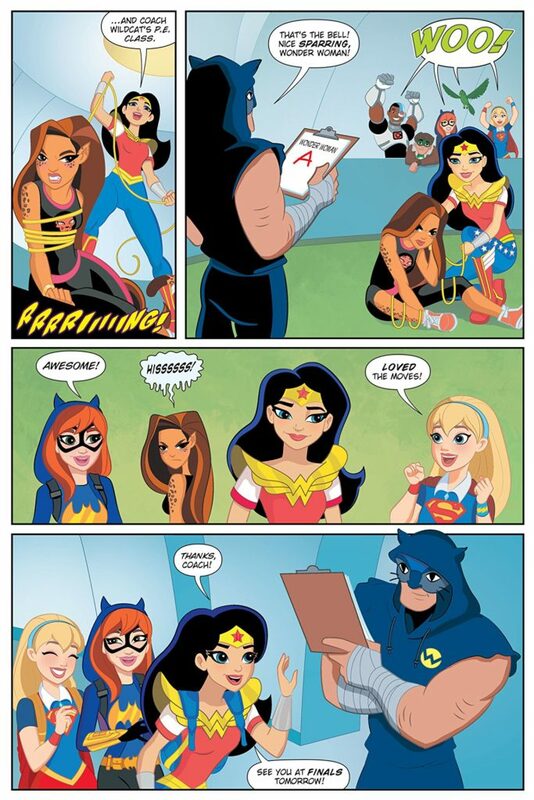 Preparing for high school exams is hard enough, but at Super Hero High, even the tests are super-tough! Principal Waller keeps an eagle eye on her students, drilling them in math, science, literature—and other subjects like flying and powers! And no one wants to fail, because Principal Waller hands out detention faster than a speeding bullet. Based on the hit new TV show, feast your eyes on this all-new, all-ages comic book series! Join Robin, Starfire, Beast Boy, Cyborg and Raven as they display their unique brand of hijinks, mayhem and justice! 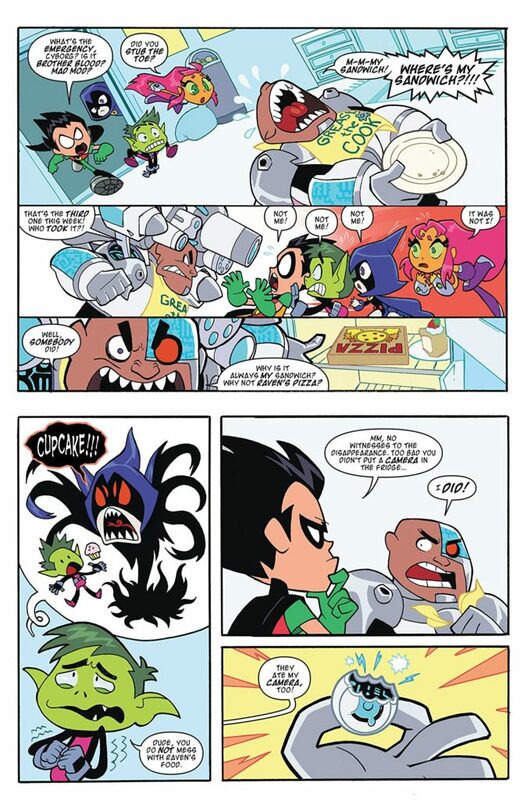 But giant pizza monsters aren’t the only dastardly and delicious villains on the menu…so dig in, Titans! 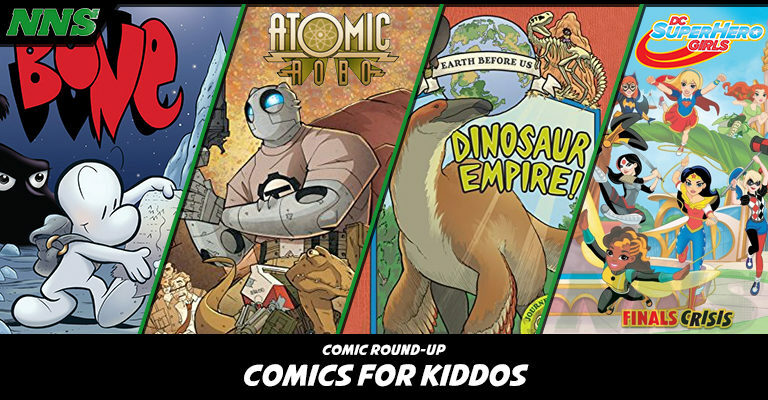 So there you have it, my list of super awesome comics for the kiddos! And maybe some adults, I won’t judge. I personally bought one of them again recently because how much I still love it. I’ll let you guess which one. What do you think of this list? Are there any comics that you loved as a kid, or that your kids currently love? Share them in the comments. Also, if you were thinking of purchasing any of these comics, please remember to check your local library and local comic book shops!